This week was devoted primarily to pattern writing, not my favorite thing. I had a technical article to write as well. I am happy to report that I finished everything and that the garments are safely in Zanesville ready for the photoshoot next week. The patterns are with the tech editor so all is well. I only had one lesson to review this week! I guess everyone is on vacation. I have corresponded with several students who put the course aside for awhile. Again, it is my policy not to enforce a time limit. Do contact me so I can give you the latest versions, particularly for the Basics class. I revised it back in April to include links to this blog. I'm not going to go into all of the uses for short rows as there are many. Typically, most knitters first encounter them to to shape shoulders instead of binding off stitches incrementally which produces stair steps. I've used this example for the photographs. In this photograph I have used short rows to shape the shoulder slope. For one side, the wrap and turn is done on the RS and for the other, it is done on the WS. The photograph below shows the short rows in progress. The increment I chose for the short rows is every four stitches. If you look closely, you can see the wraps. When the wraps are worked, they create something that looks either like a "C" or backwards "C." If the wrap is worked on the purlside, it looks like a "C". 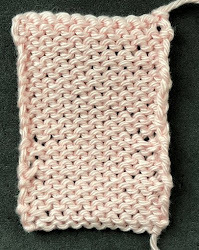 If worked on the knitside, it looks like a backwards "C." If you look closely at the photograph you can see the wraps. As I said earlier, there are several ways to work short rows. For those of you doing the Masters Program, you can select the method you want. This is something you should practice before doing the final swatch. There will be salon this weekend. Contact me for the date and time. Here is the final photographs of the Holiday Top. It turned out better than expected. I did something interesting with the neck and armhole bands. You need to be careful when doing bands for sleeveless tops. They can be too heavy. This one is barely there and it compliments BJ's Cast On. I hadn't cut the dental elastics out of the piece yet. They show where the decreases/increases are for shaping. This is the front. By the way, I used short rows to shape the back hem! You can see the wraps if you look close! This is the back. Of course, you could wear it the other way. I finished the mittens as well. The garland for the photoshoot is about 6'. Here is a close up. I did a mini garland for RedFish to display at their shows. They are going to put together kits for the garland as you would have LOTS of yarn leftover. The kits will have enought yarn for six mittens of each color. Now that I have finished up all of the stuff for Cast On, I am getting a head start on my holiday knitting. When I was in SLC in May my friend Martha picked out yarn for her Christmas present. I generally make her socks but she wanted a scarf-y/shawl-y thing. She picked out some sparkly yarn. I loved a crescent shawl Mary had just finished and Mary was nice enough to gift me the pattern--Paula Emons-Fuessle's Sister Bay Shawl. The scarf will have a crescent shape but I am going to do an applied saw-tooth garter stitch border instead. I should have it finished by the end of the weekend.